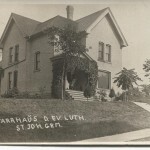 On February 20, 1890, a group of Lutheran men of Janesville, Wisconsin gathered to organize a second German Lutheran Church in the city. The gathering, members of St Paul’s Lutheran Church, left that congregation because of a disagreement over its ban on fraternal societies. On that day, an election of temporary officers was held and a constitution discussed. A Constitution was written and adopted on Feb. 26, 1890, and the name St. John Evangelical Lutheran Church was taken. At this meeting, a call was issued to Pastor G. Kaempflein of Beloit to be the pastor. The founding members of the congregation were Carl Heinrich Kueck, B. Gerard, G. Schulz, Carl Schnoeckel, Ferdinand Holz, August Abendroth, August Strampe, W. Perleberg, Carl Heiss Sr., Otto Jaecke, Jul. Berchstein, Fred. Potthoff, Fritz Vogel, Wm. Schmidt, H. Buchholz, Wm. Meyer, Aug. Gehrke, Carl Heiss Jr., Wilhelm Behm, Charles Freimann, Charles Wilkes, Gust Heiss, Herman Krebs, Friedrich Hein, Max Pfenning, Gust. Heise, and Otto Kneip. The first church property was purchased on the corner of North Bluff Street (Parker Drive) and Pease Court. On this lot were two frame buildings, one of which was remodeled and used as a church building, while the other was used as a parsonage. A small classroom attached to the church was used as a day school. 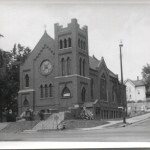 The first house of worship was ready for services on the third Sunday of June, 1890. 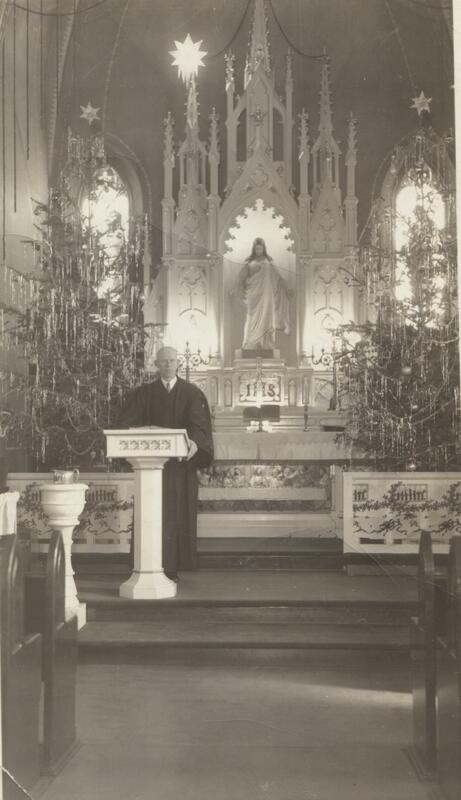 By fall, the remodeling was complete and the new church was dedicated on Sept. 13, 1890. Another German congregation, St. Mary’s Catholic Church, gave a crucifix for the altar of the new Lutheran Church to welcome them to neighborhood. Under the leadership of Pastor Kaemplein the congregation developed and increased, but God saw fit to call him home just before Palm Sunday, 1898, after he had served the congregation for eight years. After the death of Pastor Kaempflein, Pastor Paul Werth served St. John. During the pastorate of the Rev. 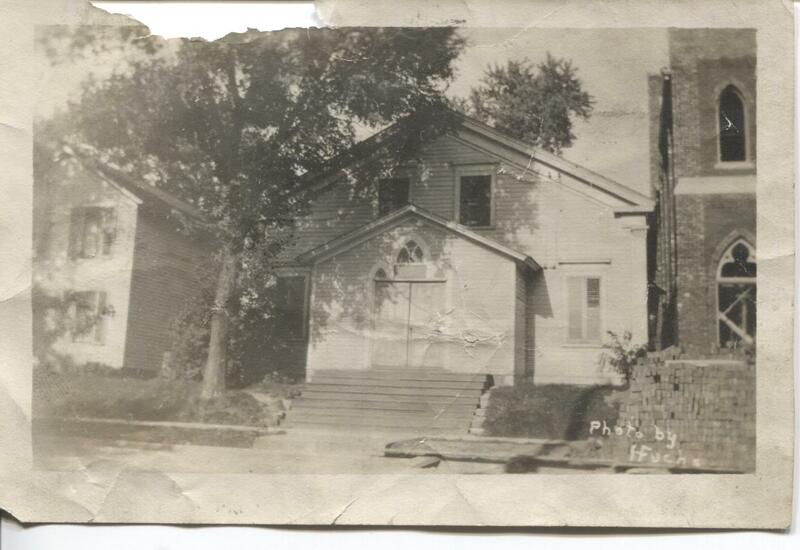 P. Werth, the parsonage at 219 Pease Court was built and the congregation was well established. Over the years the parsonage housed the families of Pastors Werth, Fuchs, Zeilinger, Keiser, Herbener, Milius, Adams, Docken and Hull. Pastor Werth served faithfully until the spring of 1909. On August 24, 1909, Pastor S. W. Fuchs took charge and the efforts of the pastor and congregation were abundantly blessed. 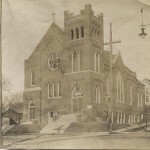 At the annual meeting in January 1913, the congregation unanimously voted to build a new church with a basement for Sunday School and other activities. Emil Pautz, who bid $13,217 for the construction of the new building, was hired as contractor. Members of the congregation donated generously for the new church. 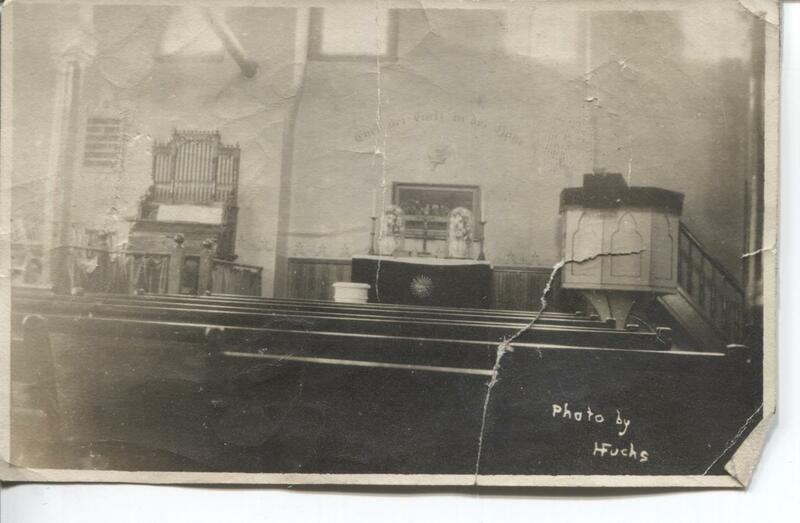 Pastor Fuchs solicited enough money from Janesville businessmen to pay for the mahogany pews. 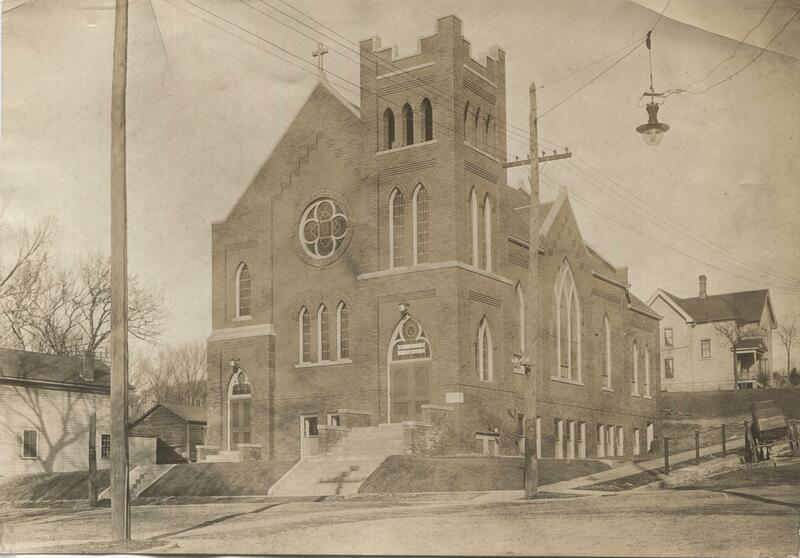 The cornerstone was laid in June, and St. John’s second house of worship was dedicated on Nov. 30, 1913. 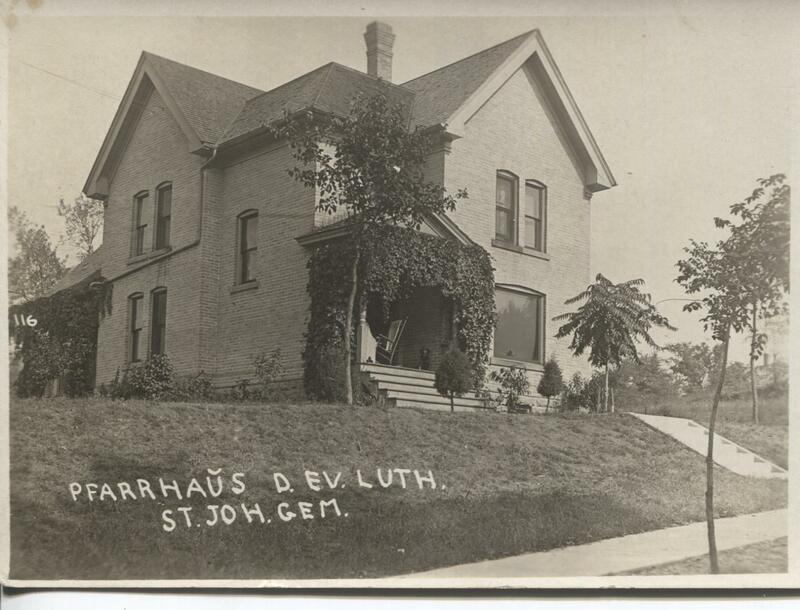 Originally all of St. John services were conducted in German and the congregation sponsored a German day school. By 1918, the day school had given way to an organized Sunday School, and English was introduced into the services and the Sunday School. German services continued every Sunday until the 1930s, when the frequency of these services was scaled back to once a month. Finally, in the 1940s, the German service was discontinued. The devoted service of Pastor Fuchs over a period of sixteen years was recorded in every line of church endeavor at St. John’s. About 1918, English was introduced in the services, as well as in the Sunday School. A Women’s Organization existed from the start at St. John, the first one bearing the name Frauen Verein, which translates “Women’s Association.” The Frauen Verein was organized “for the purpose of learning and doing God’s will.” In 1917, the name was changed to Ladies Aid Society. In 1960, the Ladies Aid Society and the Women’s Missionary Society, a group founded in the 1920’s, merged to become the American Lutheran Church Women, ALCW, a name that developed from the church’s new synod affiliation. In 1987, another synod merger resulted in another new name, Women of the Evangelical Lutheran Church in America, WELCA. Since 1890, the women of the church have met regularly for Bible study and service to others, both within the church and within the community and world. The 1920’s were a time of growth and vitality for St. John. The Brotherhood, a men’s organization, flourished and performed popular minstrel shows. Also during this time, the Luther League became so large they split into two leagues, Junior and Senior. 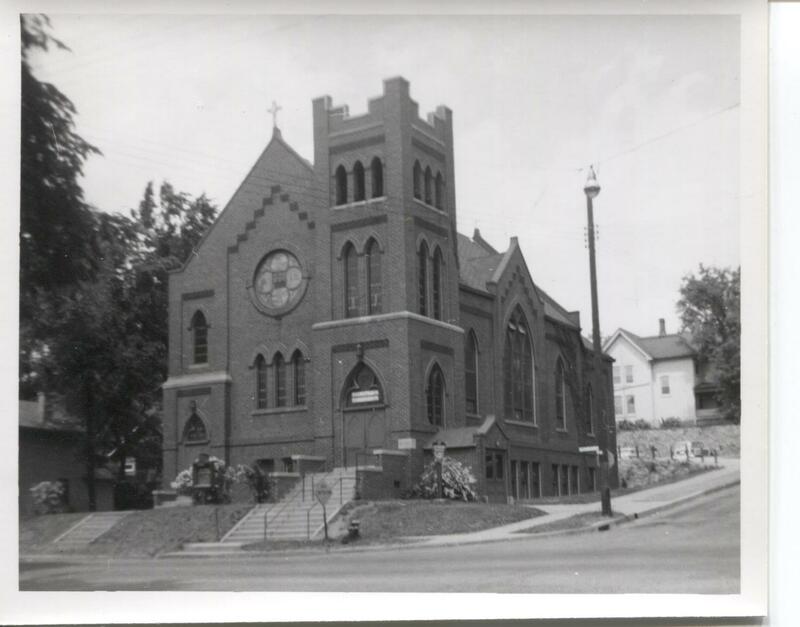 During the 1920’s, 30’s and early 40’s, St John’s pastors also served a congregation in Hanover, southwest of Janesville. The Hanover services were discontinued in 1944. On New Year’s Day, 1923, a 14-year old boy was asked to substitute for the regular organist. That boy, Al Schoenrock, would go on to be St John’s organist for sixty years until his retirement on New Year’s Day, 1983. In 1925, Pastor Fuchs resigned and Pastor A. C. Zielinger, a returned missionary from Africa, was called and took charge in June of 1925. Pastor Zielinger encouraged the interest in missionary work and soon the Young Women’s Missionary Society and the Young Women’s Missionary Society were formed. One church member, William Pfeifer, was commissioned to the mission field in New Guinea in 1927 and was soon joined by his fiancée, Elsebeth Marx, also a member of St John. During this time our pastors were also serving a congregation at Hanover, Wisconsin. On May 19, 1929, the mortgage covering the 1913 edifice was burned. The Rev. John Keiser was the guest speaker. In 1929, Pastor Zeilinger returned to the mission field in Africa, and Pastor John Keiser was called to St John. At this time German services were only held once a month. Gradually changing times brought more and more teaching and preaching in English and eventually the German services were completely eliminated. During Pastor Keiser’s Pastorate the church constitution was rewritten and the common communion cup was dropped in favor of the individual communion cup. Another change during this time was the removal of the German lettering on the front of the church. St. John became a member of the Iowa Synod. The Iowa Synod became part of the American Lutheran Church, ALC, in 1930. St John became affiliated with the American Lutheran Church, TALC, through another synod merger in 1960. There was a general remodeling of the interior of the building as well. The lettering “Ehre zei Gott in der Hohe” was replaced with the English words, “Glory to God in the Highest,” in another of the moves to Americanize the church. 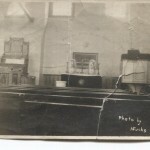 In 1940, Pastor Keiser and Pastor Gottleib Herbener of Johnson Creek exchanged pulpits. On November 29, 1940, Rev Keiser left our church to go to Johnson Creek Lutheran after serving us for eleven years. During Pastor Herbener’s term at St. John, the organ was rebuilt and a building fund was started. Pastor Herbener died in November 1943, the victim of an automobile accident. As young people of the congregation went off to World War II, an honor roll of servicemen and women was hung outside the organ chamber to the left of the Chancel. This honor roll was a banner of red stars on a white background, the stars laid out in the shape of a cross. If a serviceman died, the red star was replaced by a gold star. 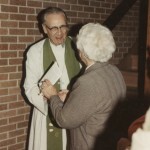 Pastor Herbert C. Milius began his 12 years of service to St. John in March 1944. 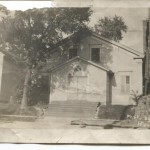 At this time, the basement of the church building was remodeled to provide additional Sunday School rooms. Another development during Pastor Milius’s term was the formation of the Junior Mission Band, which was not a musical group but an organization of young people who banded together to support mission work. This forerunner of the group known as Junior Lutherans concentrated on missions in New Guinea. The service at Hanover was discontinued in 1944. 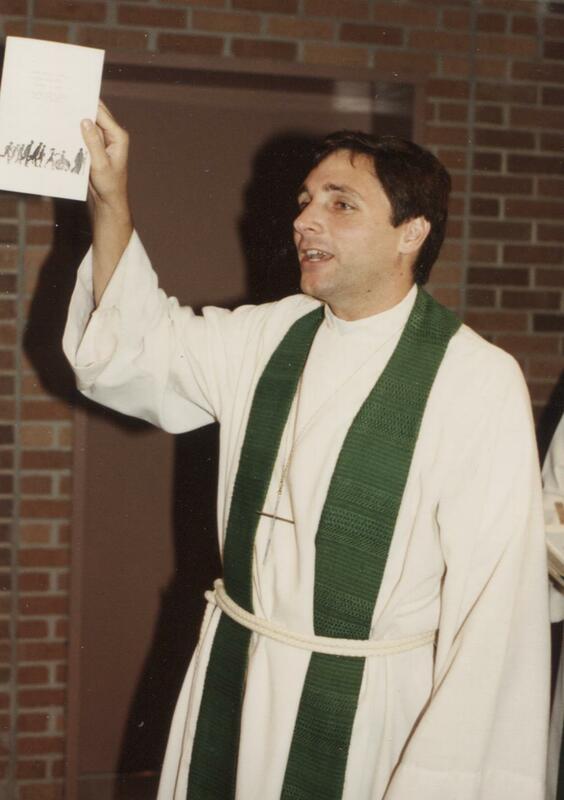 A son of the congregation, Gerald Herbener, was ordained into the ministry during this time. In 1956, Pastor Arlin Adams, a chaplain in the U.S. Army, was called to St. John. The congregation continued to grow rapidly in the 50’s and the need for a larger Sunday School was clear. Classes met in the basement of the parsonage and in three houses on Pease Court that had been purchased for use as overflow Sunday School rooms. In 1959, an educational unit was built at a cost of $250,000. 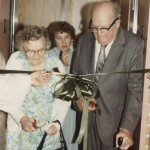 The building was dedicated on January 17, 1960. Afterward, the houses that had been used for Sunday School overflow were demolished, and the property was converted into a parking lot. Thoughts soon turned to the church itself. In 1958, the Junior Lutherans group was formed. This organization, for children from first grade to confirmation age, worked to support mission fields both abroad and in the United States. Mary Hamre headed the Junior Lutherans until it disbanded in 1986. During the pastorate of Rev. Adams. the concept of having the services of a vicar was introduced. The vicar is a seminarian who spends his third year of seminary working in a congregation. The vicars who have served here are Marvin Mueller, 1957; Marvin Mutzenberger, 1958; John Albrecht, 1959; Ronald Otterson, 1960; Paul Parlow, 1961-1962; Gerald Augustine, 1963; John Sorenson, 1964. 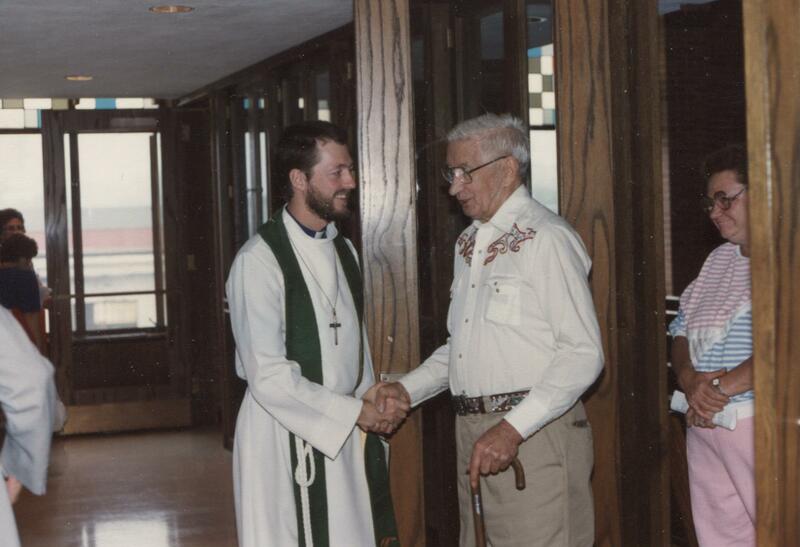 Vicar Paul Parlow served the congregation after Pastor Adams left for the armed services in October of 1961. 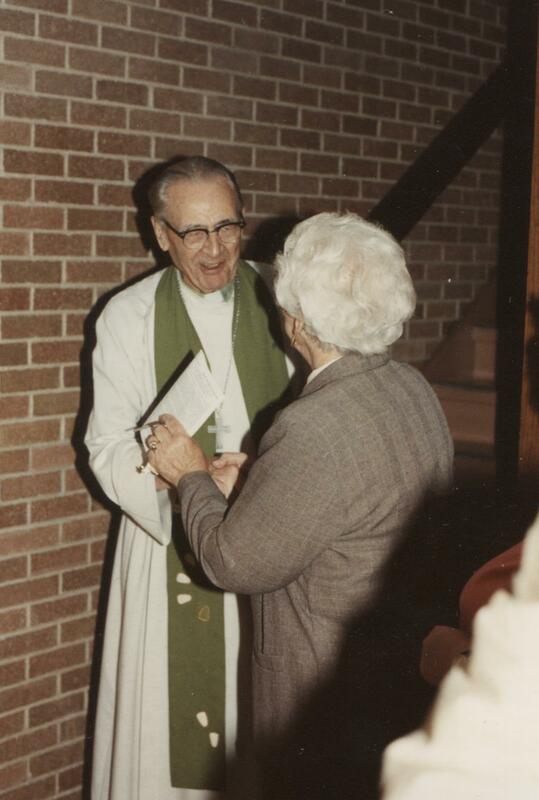 The Rev L. Donald Docken was called and arrived on May 1, 1962. In 1969, the Dockens moved into a new parsonage at 2404 Lombard Ave. After the Dockens, Pastor Chris Quello and his family lived in the Lombard parsonage. Pastor Ed Paape also lived there until his family bought their own home. The Lombard parsonage was sold in 1978. Due to the physical condition of the church and the crowded conditions in the sanctuary, a third house of Worship was imminent. At the congregational meeting in December, 1962, a building committee was elected. After a series of planning meetings, Charles E. Stade & Associates were hired as architects. Ernst Schwidder, a noted artist, worked with the architects in the design of the new worship space. Soon after the hiring of Charles E. Stade & Associates, plans for the new building and the financing were approved. The third house of worship was built at a cost of $395,000. Additional property was bought across the street for a future parking lot. The building program got under way with the razing of the old church in July of 1964, and groundbreaking for the new church took place on August 2, 1964. 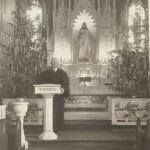 During the time of the building of the new church, the congregation held services in the Myers Theater. Sunday School continued to be held in the new educational unit. The congregation responded wonderfully during this challenging time and the work went forward without interruption. The cornerstone was laid on October 25, 1964, with council members, organization officers, and building committee members all taking part in placing appropriate articles in the cornerstone. New articles, as well as the old articles from the 1913 cornerstone, were included. They looked forward to our 100th anniversary when the cornerstone would again be opened. Due to the splendid cooperation between contractors and building committee, the new church was completed and was used for the first time on May 30, 1965. The congregation met for an opening service at the Myers Theater and then processed to the new church, preceded by the Boy Scouts bearing the Christian and American flags, Pastor Docken, Vicar Sorenson, the council members carrying the altar furnishings, the confirmation class, and the choir. The contractor gave the key to the architect, who presented it to Willard Naatz, chairman of the Building committee. Mr. Naatz opened the door and Pastor Docken invited all to enter the Lord’s House. The first memorable occasion in the new church building on this first Sunday was the confirmation of 31 young people. 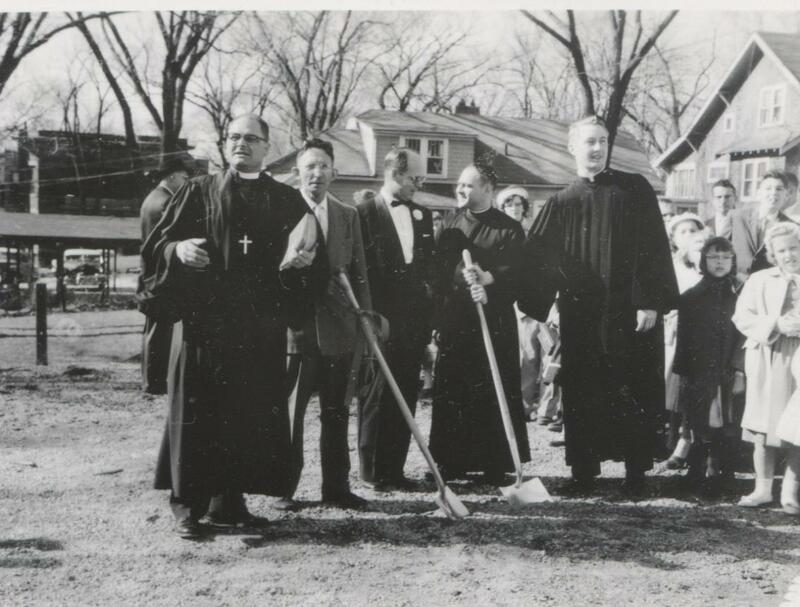 With several items around the church to be completed, the dedication was set for October 3, 1965, with Dr. Myron Austinson, President of Southern Wisconsin District, ALC, as the Dedicator. It was decided to set apart October as Dedication and 75th Anniversary month. On October 24th we observed the 75th Anniversary of St John Lutheran Church. We are thankful to the members who have faithfully supported and contributed to the work of the church at home and abroad over all these years. The Bethel Series, an adult Bible study, was taught for the first time in 1965 and continued for several years. Another popular Bible Study, SEARCH, began in 1985. When Pastor Irvin Suby joined the St. John’s staff in 1965 as a visitation pastor, the vicar’s position was discontinued. Pastor Suby worked on a part-time basis among the elderly and shut-ins until his death in 1969. Afterwards, Pastor Ernest Burtness became visitation pastor. He served the congregation for 20 years, retiring on Dec. 31, 1989. Next came Pastor Jerome Pribbenow in 1990, Pastor Ralph Sandgren in 2000, Pastor Rebecca Rossow in 2003-2004, Pastor Roy Poltrock in 2004-2006, and Pastor David Nelsestuen 2011-2012, and 2015-present. Beginning in 1971, fifth graders received their First Communion. Prior to this time Communion had been part of the rite of Confirmation. 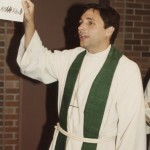 When Pastor Docken left St. John for Hudson, Wisconsin in 1974, Pastor Christian Quello became St. John’s senior pastor. 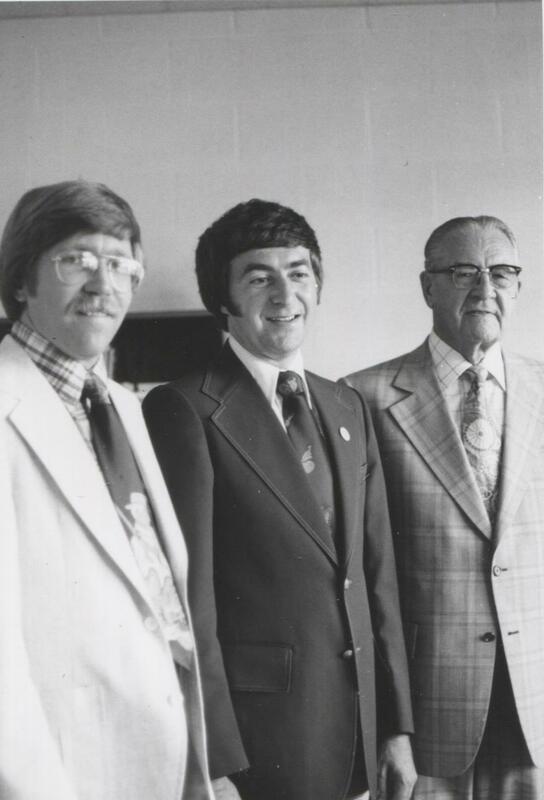 At the annual meeting in 1973, the congregation voted to hire a second full-time pastor. 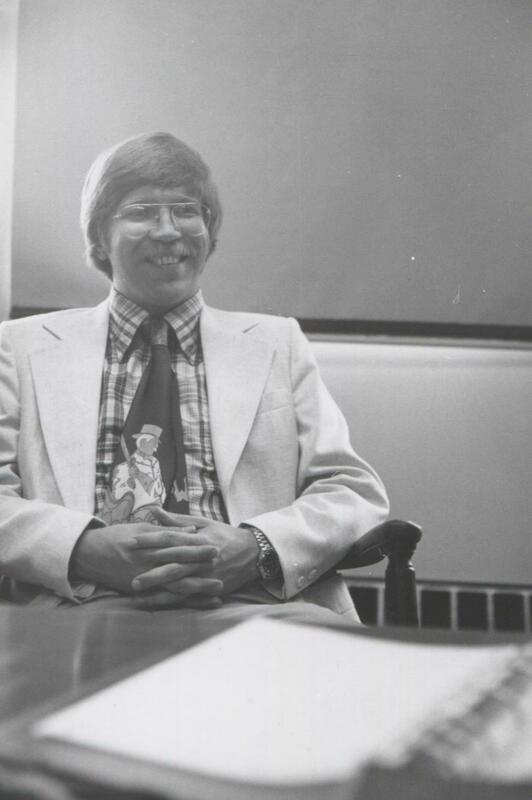 Pastor Elliott Hull became St. John’s first full-time assistant pastor in August 1973. 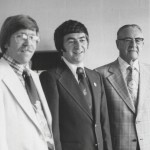 He was succeeded by Pastor John Hilbert in 1975, followed by Pastor Jim Davis in 1977. 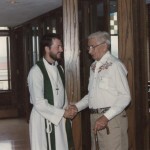 Pastor Davis was followed for a short period by Pastor Michael Wonderlich in 1980. 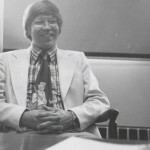 In 1980, David Fredrickson joined the staff of St. John as associate pastor, a title change which reflected a shared ministry with the senior pastor. Pastor Frederickson was succeeded by Pastor Jeff Wild in 1984, followed by Pastor Glenn Berg Moberg in 1989. In 1975, the congregation acquired the Slightham property north of the church on Parker Drive. The property was converted into a prayer garden by the men of the church and dedicated on June 22, 1975. St. John’s television ministry began in 1975. Larry Fry was our first TV ministry Chairman. He set up the protocols and equipment to videotape your services and maintained them for over thirty years. Larry held the chairman’s position until 2008, when Ryan Dooley was hired. Ryan is serving this ministry at present. 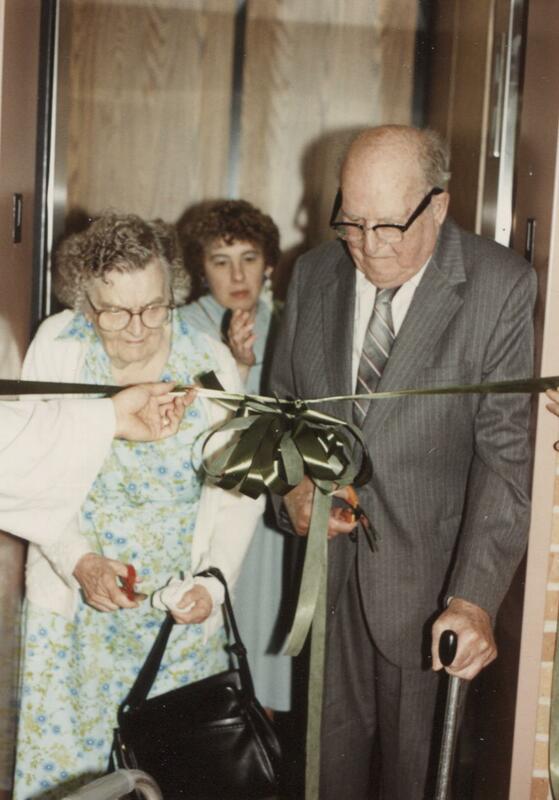 Beginning in 1977, the Rock County Senior Citizen Nutrition Program, known as the Golden Diners, used St John’s kitchen and Friendship Hall to serve meals to senior citizens. Phyllis Haugen served as the coordinator for the program until her retirement in 2003. The church building has served as a meeting place for many other community groups over the years, such as Al-Anon, TOPS, Boy Scouts, Girl Scouts, Spotlight on Kids, farmer’s co-ops, a day school for the Janesville School District, the GIFTS Men’s Shelter, and the distribution site for the ECHO School Supply and Christmas Toy Drives. The ECHO Community Dinner is served here on the last Saturday of each month. After Pastor Quello resigned to take a position at ALC headquarters, Pastor Edward Paape became St. John’s senior pastor. In 1979, the green “Lutheran Book of Worship” (LBW) was introduced to the congregation. It replaced the red “Service Book and Hymnal,” which had been used since 1959. Beginning in 1979, our church sponsored a Cambodian family of thirteen. On July 30, 1979 the family arrived in Janesville from a refugee camp in Thailand, which had been their home for four years. The family consisted of four sisters, their husbands and children, a 14- year old girl and their 59-year old mother. They were brought here under the auspices of LIRS (Lutheran Immigration Refugee Service) and taken under the wing of St John Lutheran Church, our pastor Ed Paape, and sponsors, Ronald and Sandra Skildum. They were housed in the parsonage next to the church until they were able to support themselves. At present, two families live in the state of Oregon, where there is a large community of Cambodians; the remaining two families live here in Janesville. In 1980, the congregation held a celebration for its 90th anniversary, and, in 1990 a large celebration for its’ 100th anniversary. On April 12, 1981, Palm Sunday, a ceremony was held to burn the mortgage on the church. The same year, the upper parking lot entrances to the church and the educational unit were enclosed for energy conservation. On Reformation Sunday 1983, Pastor Paape dressed as Martin Luther and nailed 95 theses to the church door. Other members dressed as friends and relatives of Luther as part of a service honoring the 500th anniversary of Luther’s birth. The St. John Lutheran Church Foundation was formed in 1983. Its purpose is to provide a structure for the financial support of the church, which allows for the undertaking of major projects and benevolences that cannot be financed through the regular church budget. In 1986, the Foundation created the Century Fund as a depository for the money necessary to carry out the special projects which the Church Council has identified as meeting the needs of St. John’s second century. Two elements of the Century Project, the reconstruction of the outside walls of the educational unit and the installation of an elevator running from Friendship Hall to the narthex, were completed in 1989. The purchase of a van to transport shut-ins and youth, and the air conditioning of the nave were two other elements of the project. One additional element of the Century Project is ongoing; it calls for setting aside monies for use as a contribution to the mission work of the national church. On January 1, 1987, St John became part of a new synod, the Evangelical Lutheran Church in America, ELCA. The new synod consists of the former American Lutheran Church, Lutheran Church in America, and American Evangelical Lutheran Church, and is the largest Lutheran synod in America. In 1989, in an unprecedented move for St. John, Pastor Jeff Wild was called from his position as associate pastor to be the church’s twelfth senior pastor. Pastor Glen Berg-Moberg was called to be the Associate Pastor. During his tenor, the congregation put a great emphasis on music. Pastor Glen started a contemporary worship music group which was very well liked. In 1991, members of the congregation donated money to purchase hand bells for the formation of a hand bell choir. The choir was called “The Chapel Chimes.” Karen Walker was the Chapel Chimes director from its inception until she retired in 2005. Scott Gregor was the final director from 2005 until the hand bell choir was discontinued in 2006. In 1995, the blue book of worship titled, “With One Voice” was added to our resources. In 2006, the green “Lutheran Book of Worship” was replaced with a cranberry red service book, titled “Evangelical Lutheran Worship,” which is currently in use. In 2009, the 1964 Verlinden pipe organ was in need of major repairs and updates at a cost in excess of $100,000. A commitment was made by the Saint John Lutheran Foundation and from an anonymous donor for a total of $40,000 in matching funds. The remainder of more than $60,000 was funded through member contributions and memorial bequests. In 2009, the Janesville School district rented the lower floor of the educational building for a charter school called the CRES Academy. They were here until 2011. In 2012, a computer, video projector, and projection screen were installed in the sanctuary, so that members of the congregation could follow the order of the service and musical lyrics on a screen mounted in the front of the sanctuary. In 2014, we were visited by archivists, who documented the carvings which decorate our sanctuary. The carvings are the work of the renowned artist, Ernst Schwidder. Photographs of our sanctuary art and the original paraments, which were also designed by Mr. Schwidder, will be archived at Purdue University in a collection of Mr. Schwidder’s work. In his career, he designed the interior art for over 300 churches in the United States. St. John Lutheran Church is active in ministry to the community through participation in such programs as ECHO, ECHO Community Meals, ECHO Christmas in July, GIFTS Men Shelter, Meals on Wheels, Crop Walk, Al-Anon meetings, ECHO School Supply Drive, ECHO Christmas Toy Distribution, Red Cross Blood Mobile, Radio License testing for Ham Radio (ARRL), REACT Radio Group meetings, Shoe cutting for overseas, Malaria Campaign, Sunday Service TV broadcast, Extended Care (sends cards to homebound members), collecting used medicine containers for Health Net, 16:49 Project for Homeless Teenagers. St. John is also active within our congregation. We do Hanging of the Greens at Christmas, the Women of the Church make layettes, personal hygiene, and school kits, and quilts for Lutheran World Relief (LWR) and local area charities. We have soup lunches before and after Lenten services, Easter Breakfast on Easter Sunday, OktoberFest in the fall, a Fourth of July Picnic, Outdoor Worship Services during the summer at Court House Park Amphitheatre (as of 2014 these services were moved to our own Prayer Garden) and Women’s Bible Study Groups. There is a Prayer Shawl Group, which meets monthly to make Prayer Shawls to distribute to people who are sick, shut-in or need comfort. Beginning in February 2014, the congregation engaged in a year-long remembrance and celebration of the last 125 years. Each month featured displays in the Narthex, which were based on the theme for the month. Monthly activities and displays recapped our history. The festivities wrapped up with a Worship Service and Banquet held on February 22, 2015. On that date, we held a banquet, attended by pastors, members, and staff, both past and present. The collected research and displays of the entire year were presented. Attendees recorded their names for our ongoing history and were given souvenir booklets to take home.